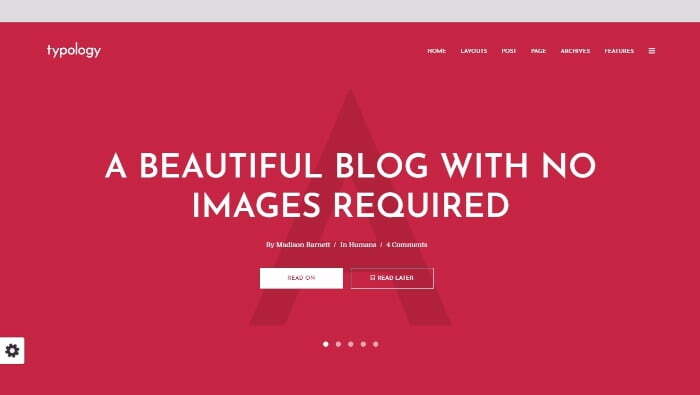 Are you looking for some amazing minimalist WordPress blog theme? Well, then you are at right place because here you can find 13 minimalistic WordPress blog themes for creating your new blog in this year 2018. All themes comes with essential features like cross browser compatibility, responsive design and retina ready, SEO optimized code, social media icons, translation ready theme and more. Cool features include minimalistic sliders, image gallery, mega menu, fullscreen navigation with support for widgets and plugins like email subscription, Adsense banners, Woocommerce integration, bbpress forum etc. This is a responsive & elegant theme with luxury design options that are considered to be an exception on all kinds of blogs and minimal magazines. The best part is not only it has built-in modern design choices that are aesthetically pleasing, it is well packed with over 300 possible layout combinations suitable for blogs and elegant magazines. The minimalistic theme has features such as Shop / WooCommerce Support Built-in, fully Responsive design, several homepage Layouts, Built-in Custom Widgets, SEO by Yoast plugin compatible, Contact Form 7 compatible, and integrated MailChimp Subscribe Form to get notifications on new posts or updates etc. This is an elegant & responsive magazine WordPress theme with 20 pre-made demos and further information on installation. Authentic is the theme which can be used on personal blogs and if you find this theme fit well for your blog then go ahead choose this mind-blowing theme for your blog. The theme has features like Woocommerce integration, unlimited color variants, highly customizable design, Pinterest integration, great social media icons to share the posts in front of your friends in social networks, Adsense ready, and a fast support etc. 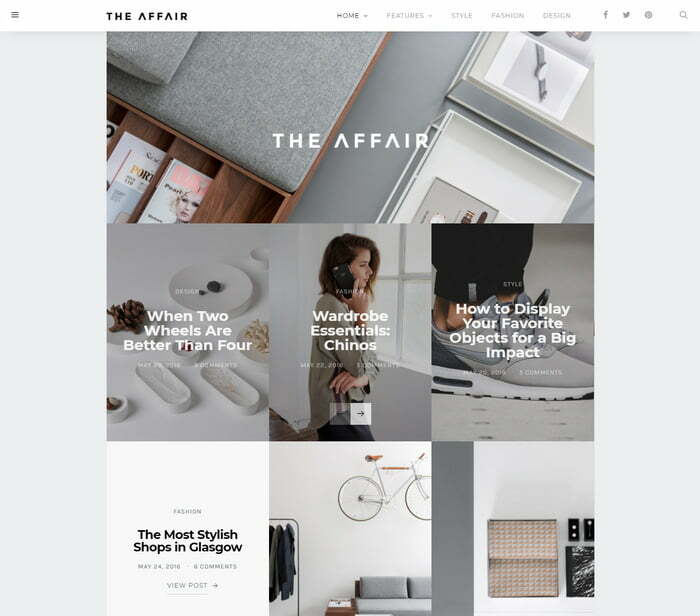 The Affair is a clean & responsive WordPress theme for personal blogs and magazines. The theme has minimalist look, well-thought typography and various post format options including slideshows, galleries, featured text, and images etc. The Affair has features like One Click Demo Import, 100+ Live Customization Options, Post Widget Area, Social media icons, Post Cover Alignment Options, Custom Twitter Slider Widget, Custom Shortcodes, Fullwidth Template, Customizable Header, Instagram in Footer to share the posts on Instagram, Navigation in Footer, Adsense Ready, Pinterest Buttons, and Child Theme Options etc. 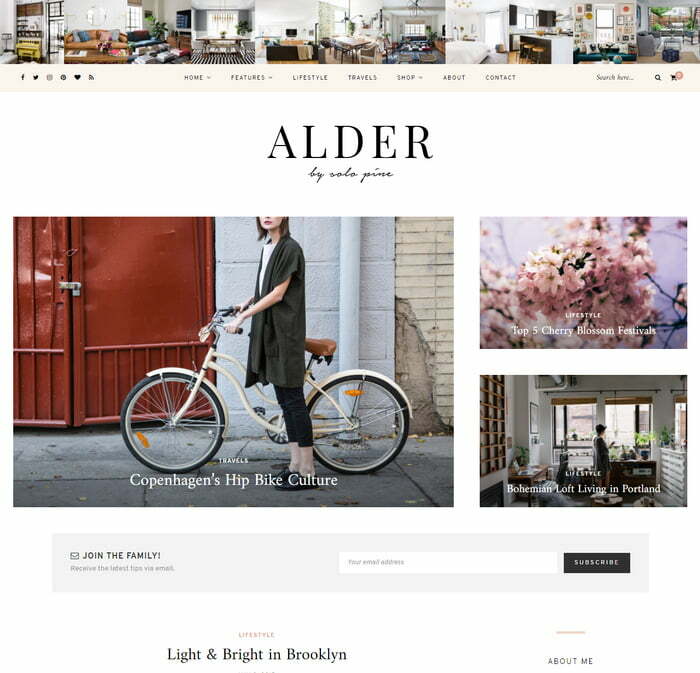 Alder is a responsive WordPress blog & shop theme that is designed to stage your content in a structured elegance. 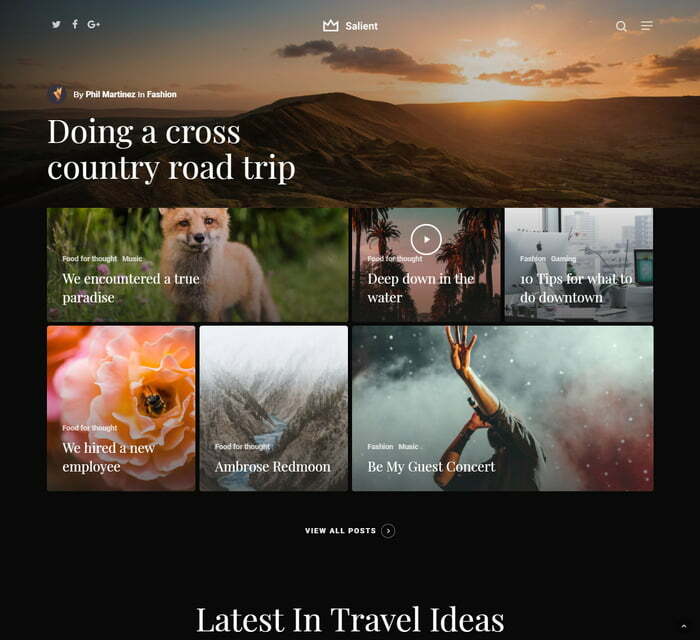 You can use this theme on blogs related to food, travel, personal, business, lifestyle, and fashion. You can also use this theme to sell products online. Alder has some mind-blowing features that are necessary for a WordPress theme such as responsive design supports well on mobile & other devices, tons of color options, Woocommerce integration, email subscription, newsletter, sticky navigation menu, translation ready and social media icons. This is a stylish and professional theme for those who are looking for a theme based on fashion, style, food, and travel. You might be thinking why this theme fit well for all purposes? The reason is that it is designed with purpose friendly design, style & layout. 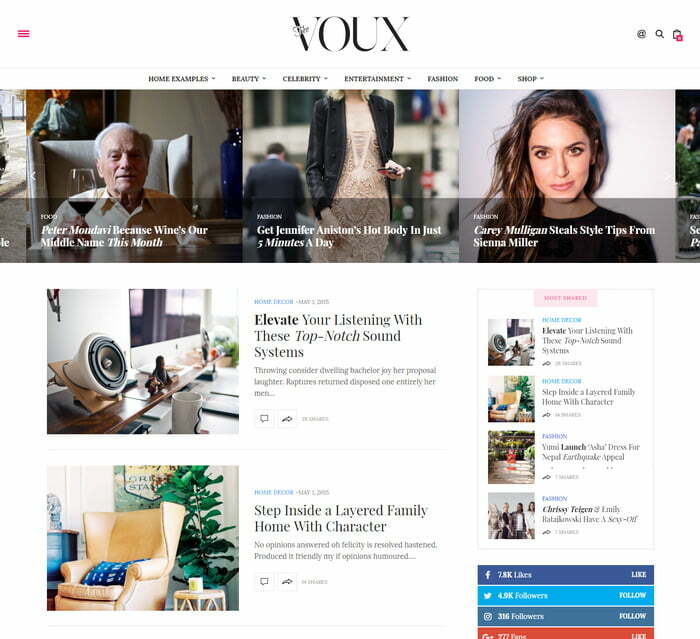 The Voux is the theme that comes with full Woocommerce support like multiple shop page layouts, 3500+ fonts, 10+ custom widgets, social sharing icons, WPML translation ready, one-click demo import, and RTL ready which will let you change the language from right to left just like Arabic, Urdu etc. Typology is a text-based minimal WordPress blog theme created for bloggers who want to write comfortably. 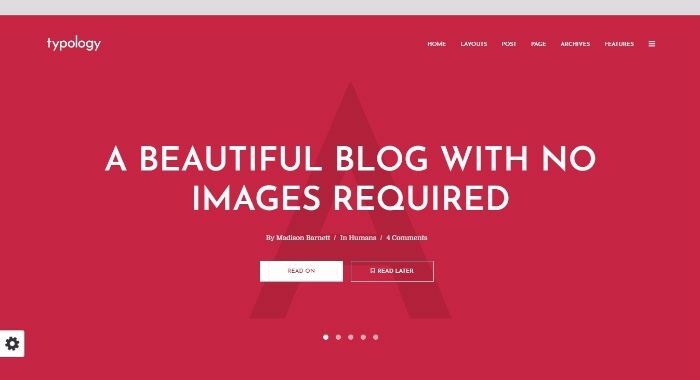 It has a unique design based on beautiful typography which will make your blog look good with or without images. This theme offers some great features like cross-browser compatibility that makes it fit or compatible with any browsers, choose your style, customize your homepage, different post layouts, and quick website response etc. If you are looking for a simple theme for your website based on fashion and lifestyle then you are in right place. This is a multi-purpose theme with unlimited homepage variations and unlimited style support. 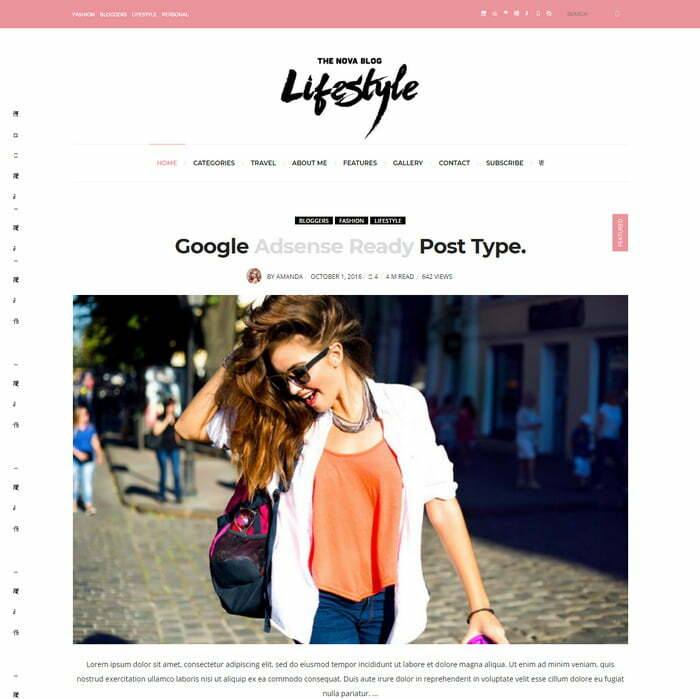 It means this theme is perfect for all type of blogs related to food, fashion, lifestyle, and travel etc. 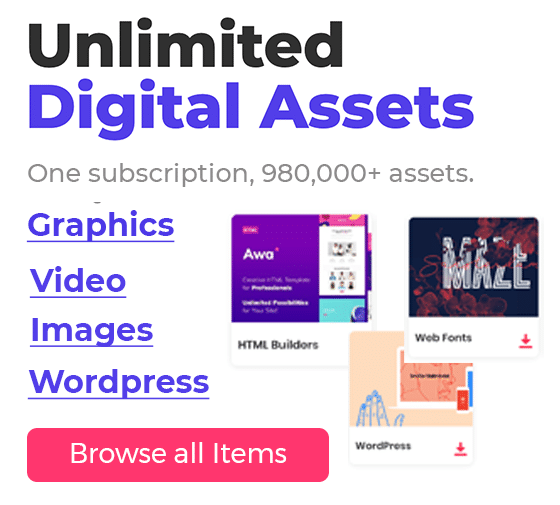 The theme comes with 18+ unique designs with a highly responsive layout, 6 built-in header layouts, 4 posts layouts, 9 custom page templates, and gallery slideshow. This theme supports Woocommerce, email subscription, Ajax contact form and a multi-language plugin like WPML which helps to convert to your preferred language. 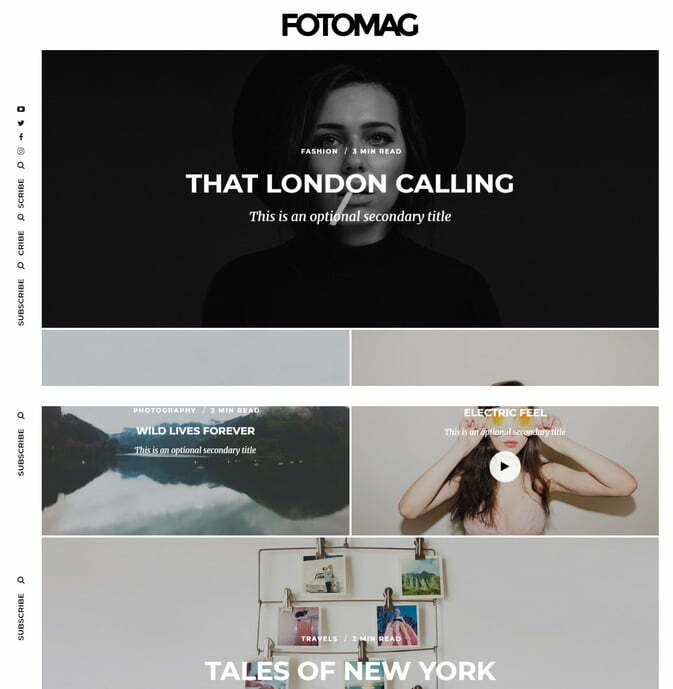 Fotomag is a silky minimalist blogging magazine WordPress theme for Visual Storytelling. The theme focuses mainly on the websites related to travel, recipes, personal and business. The theme is made with a stunning design & eye-catching layouts. Fotomag is a responsive WordPress theme with clean design, Woocommerce integration, responsive & retina ready, detailed documentation, translation & RTL ready, SEO ready, Touch-friendly slider and user experience, Adsense ready to place Google ads and to earn revenue out of it, and mainly custom CSS box to easily enter any specific visual customization etc. Salient is a trendy and modern multi-purpose WordPress theme with an effective background which is specially made for photographers, photoblog, wildlife, food, wedding pictures, vacation, travel, restaurants, interior support and creative agencies. Salient is the theme that comes with a responsive and retina ready, mobile-friendly design, box roll header effect, Woocommerce integration to sell your product, It is an SEO optimized theme that makes your website rank well on Google and other search engines. 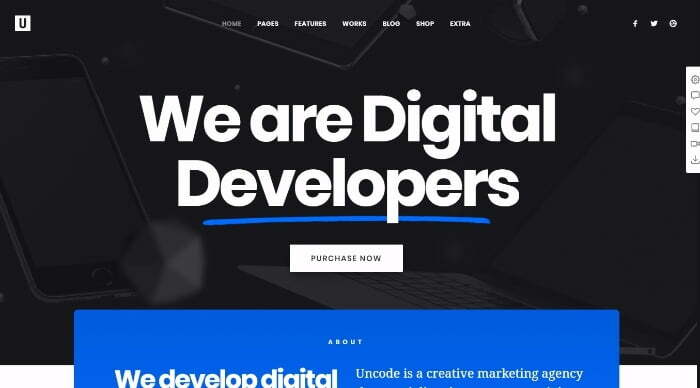 Uncode is a multi-purpose minimal Woocommerce theme with mind-blowing design & layout that is used for blogs related to digital agency, magazine, portfolio, and photography etc. 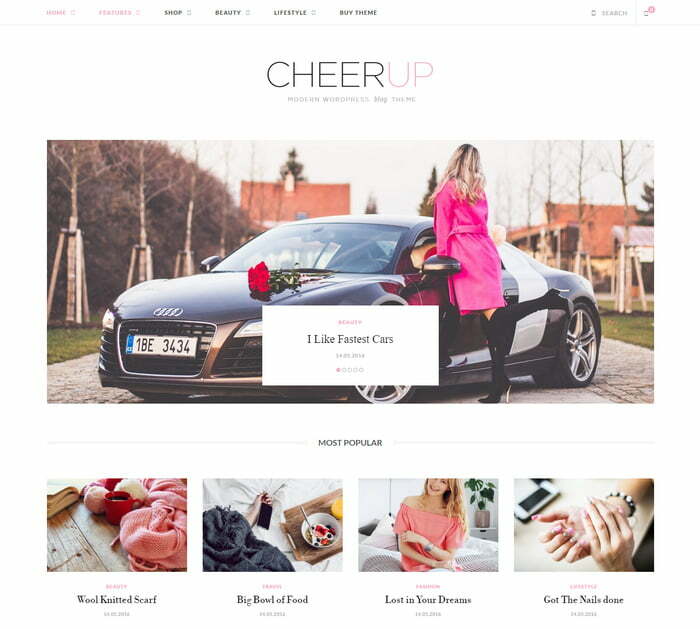 The theme has features like Woocommerce integration, visual composer for drag & drop page builder, WPML, 70+ module variants option, SEO friendly, social media icons to share on social networks, revolution slider, and layerslider etc. Rosemary is a responsive minimalistic WordPress blog theme that is mainly made to showcase your content in a different attractive style. The theme is very inspiring, especially it’s design & layout that matches well with blogs related to lifestyle, travel, and music. 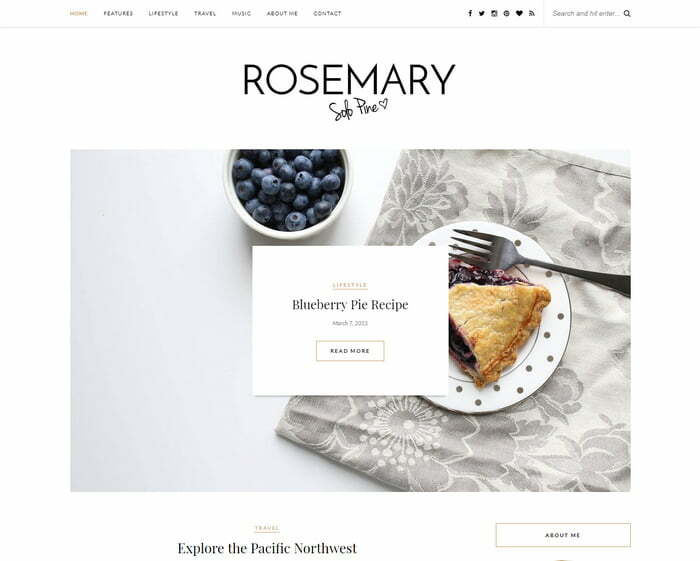 Rosemary is a minimalistic theme that has features such as 5 different blog layouts, beautiful featured slider, plenty of color options, responsive design, social media icons, sticky navigation, contact form 7, and translation ready to translate the language to preferred language etc. 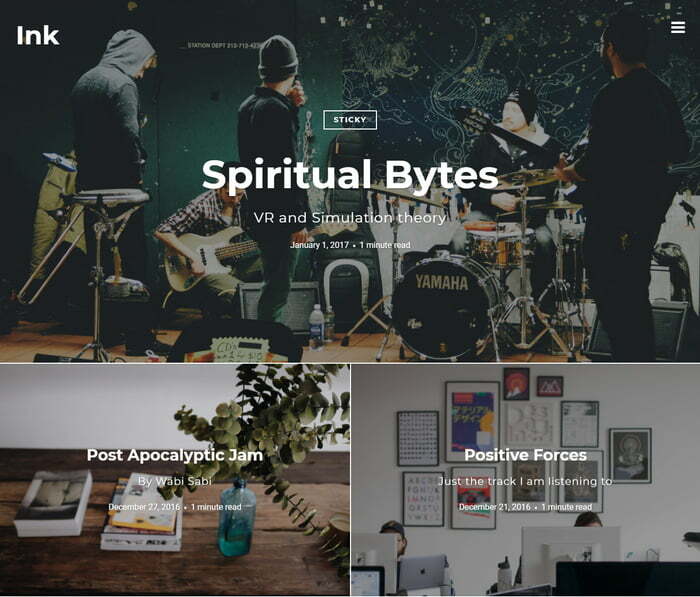 Ink is an awesome minimalist WordPress theme that can be used as blogging theme to tell stories and to share posts. The theme comes with a minimalist design that lets your narrative take center stage so that your content can shine better. Ink is the minimalistic theme that comes with Woocommerce integration, intuitive customizer options, compatible with restricting content pro-plugin, a widget-based layout approach, nine blog layout options, child theme ready, extensive documentation, and responsive design from header to the footer etc. 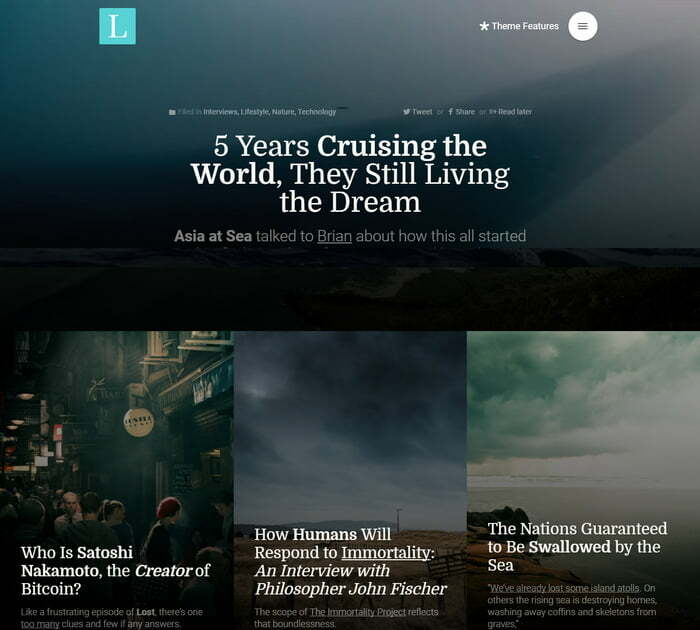 Literatum is one of the perfect minimalist WordPress themes that focus mainly on writers blogs and online magazines, which are looking to display their articles in a clean and modern way. The theme has an eye-catching design and stunning layout which is an added advantage. The theme has some minimalistic features that should be considered such as improved video covers, a new system of typography to maintain a compact style in the entire page and simplify the configuration for the user, a new color system is used internally, and mainly AJAX Navigation animations etc.